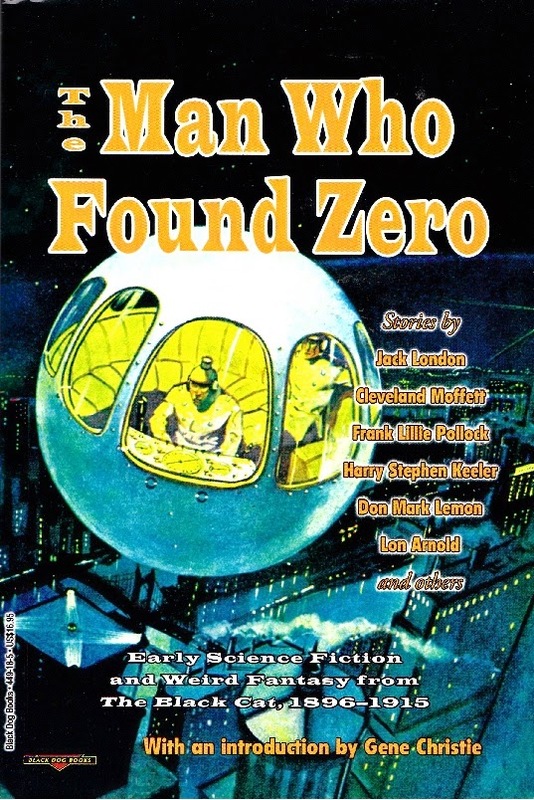 The Man Who Found Zero, edited by Gene Christie and issued by Black Dog Books, is an anthology of early science fiction stories originally published in the American magazine The Black Cat between 1896 and 1915. Science fiction has a longer history than most people imagine. Some people indeed trace its beginnings back as far as 1657, to Cyrano de Bergerac's Journey to the Moon. Early tales such as these were generally closer to being fantastic adventures or satires than to what we think of as science fiction. True science fiction is an invention of the early 19th century, with Mary Shelley’s Frankenstein in 1818 being the genre’s first masterpiece. The term science fiction would not come into general usage for another century, with terms like scientific romance being favoured in the 19th century. By the end of the 19th century a considerable body of work had already been produced the genre, mostly in France. American authors had made their mark as well with both Edgar Allan Poe and Nathaniel Hawthorne writing important and excellent science fiction stories (Hawthorne’s Rappaccini’s Daughter is a particular favourite of mine). It was not until the 20th century that space exploration became the genre’s dominant theme. This was perhaps an advantage to the genre’s pioneers since they could unleash their imaginations in virtually any direction they chose. The stories in The Man Who Found Zero illustrate the extraordinary diversity and interest of the stories that resulted. Some of these tales are quite whimsical. Thomas F. Anderson’s A Mental Mischance is a mildly diverting story of mind-reading gone wrong. Sam Davis’s Bigler’s Barometer is a very whimsical tale indeed of a man who finds an unusual method for predicting the weather. Charles E. Mixer’s The Transposition of Stomachs is an amusing prediction of organ transplants. W. George Gribble’s A Man and a Mermaid manages to combine whimsy with a touch of romance. Others are rather more grim. In Jack London’s A Thousand Deaths, one of the best stories in the anthology, a man finds himself being used as a scientific guinea pig and he really does suffer a thousand deaths. It’s very creepy and it includes some fun pseudoscience. Katharine Kip’s My Invisible Friend concerns a young man seeking the secret of invisibility. It was published in 1897, four months before H. G. Wells published The Invisible Man. In Cleveland Moffett’s fine but grisly tale On the Turn of a Coin a man has a vision of a woman being murdered and a murderer is convicted on the evidence of a dead woman. Other stories are surprisingly (although often amusingly) cynical. Clifford Howard’s excellent The Annihilator of the Undesirable deals with a company that offers an unusual service - they will, for a very reasonable fee, entirely remove from existence anyone whom their clients find irritating or inconvenient. And then there are stories that are simply bizarre. John Durworth’s very imaginative In an Unknown World concerns a man who sees sounds and hears sights. Ethel Watts Mumford’s When Time Turned is a gently melancholy tale of a man living his life backwards, which proves to be an oddly heart-breaking experience. Newton Newkirk’s In the Sierra Madres is particularly strange. A Mexican scientist, a man in early middle age, tells his story. It involves volcanic eruptions, the mysteries of liquid air and the adventures of three daring highwaymen half a century earlier. Wildly far-fetched but wildly original. In Eugene Derby’s Tunnel Number Six miners in New South Wales hear a voice pleading for help - a voice that comes from behind a wall of rock where no human being could possibly be. Is the mine haunted? The explanation is extremely far-fetched but it certainly qualifies as original. Bert Leston Taylor and Edward Ward’s The Cross of Fire is also far-fetched, dealing with an extraordinary optical invention discovered in the backwoods of Maine. Eva L. Ogden’s The Cold Storage Baby is another real oddity - a missing diamond and a baby that shouldn’t be there but is and may have been in cold storage for twenty-nine years. It's a story that might possibly be too clever for its own good. Given the popularity of hypnotism and the new “sciences” of psychology and psychiatry in the 19th century it’s not surprising to find stories here dealing with the powers of the mind. I. Crane Clark’s Where Is Robert Palmer? is such a story, and a decidedly odd one. Frank Lillie Pollock’s The Invisible City concerns an anarchist terrorist (anarchist terrorist outrages being an all too frequent feature of the late 19th century) who is also a brilliant but megalomaniacal madman with extraordinary powers of mind control. Don Mark Lemon’s The Mansion of Forgetfulness also deals with the mind although in a very different manner. Is forgetfulness better than pain? Perhaps, but not always. This is probably the single best story in the anthology, with a nice twist ending and a considerable emotional punch. Some of the stories here are more in the style of what Lovecraft would later describe as weird fiction, with some definite hints of horror. Frederic van Rensselaer Dey’s A Witch City Mystery gives the initial impression of being very much in the Lovecraft mould, with an elderly chemist conducted some very arcane researches into the mysteries of life itself. The story ends up being not quite what we were led to expect but fascinating nonetheless. Cleveland Moffett’s The Mysterious Card is an exceedingly clever piece of weird fiction. An American visiting Paris is handed a card by an unknown woman. Since he does not speak French he cannot read the message on the card but when he tries to have the message translated the effects are extraordinary to say the least. Don Mark Lemon’s A Bride in Ultimate is also what I would call weird fiction and it’s a fine slightly creepy story. It opens with an American trying to explain to a French border guard that he absolutely must cross the frontier into Spain to find the man who has stolen his wife. The border guard informs him that the man in question was journeying alone but the American explains that the man was carrying a diamond and the diamond is his wife. Not in a figurative or metaphorical sense, but quite literally. It’s an unsettling and very effective little tale. Octavia Zollicoffer Bond’s story, A Rule That Worked Both Ways, is an intriguing science fictional ghost story. Lon Arnold’s The Man Who Found Zero is the closest thing here to a space exploration story - a suicidal man is sent to the very edge of space to find the temperature of absolute zero. Frank Lillie Pollock’s The Skyscraper in B Flat is science fiction of an even more inventive bent. The moral of the story would seem to be that skyscrapers and music are a very bad combination. Surprisingly perhaps to modern science fiction readers Harry Stephen Keeler’s John Jones’s Dollar is the only story in the anthology to be set in the distant future. Compound interest might seem an unlikely subject for an SF story but that is in fact what the story is about. The Man Who Found Zero is a remarkably diverse and interesting assortment of stories. Very highly recommended. The writing of Sherlock Holmes pastiches seems to have an extraordinary appeal to writers both good and bad, professional and amateur. Not surprisingly this cottage industry has given the world some very forgettable and often very embarrassing fiction. Among the fairly small number of writers whose work in this field is fairly well thought of is August Derleth. 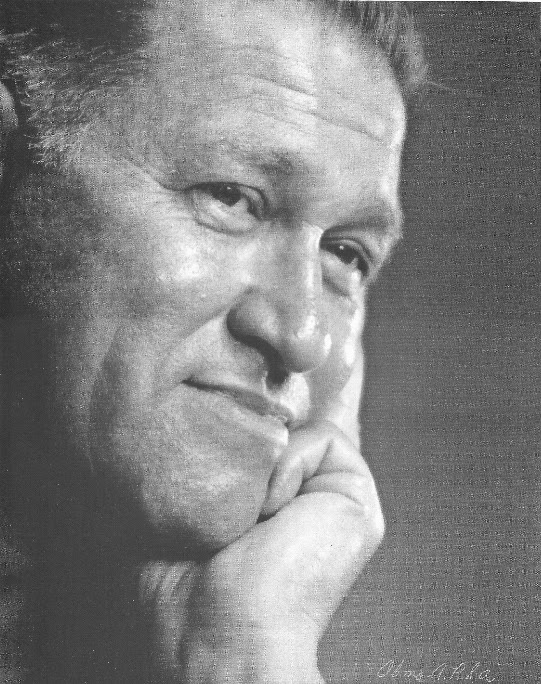 August Derleth (1909-1971) was an American writer best remembered as being the man (in his rôle as publisher and editor) largely responsible for bringing the work of H. P. Lovecraft to the attention of the public. Derleth wrote quite a few Lovecraft-inspired stories in the Cthulhu Mythos as well as work in a variety of other genres. His horror stories are uneven but often excellent. As a very keen Sherlockian he naturally tried his hand at writing Sherlock Holmes pastiches, with considerable success. Being unable to use the Sherlock Holmes name Derleth renamed the great detective Solar Pons and relocated him from 221B Baker Street to 7B Praed Street. Pons is however quite obviously Sherlock Holmes and all the other familiar characters (all suitably renamed) appear in his stories. The only major change is that the setting is moved forward to the 1920s. Derleth’s knowledge of London was derived almost exclusively from his reading of the Sherlock Holmes stories, a circumstance that could have been a disadvantage but in fact becomes something of an asset. Derleth might have been a little hazy at times on London geography but he had absorbed the atmosphere of Conan Doyle’s stories and he reproduced it quite faithfully. There’s no need to say anything at all about the character of Solar Pons since he is a exact replica of Sherlock Holmes. Dr Parker performs the Dr Watson function as assistant and narrator. The Return of Solar Pons is a collection of some of Derleth’s later Solar Pons stories. The Adventure of the Lost Dutchman does have a genuinely Sherlockian feel to it, with an odd setup that that only the great detective can make sense of. It also has an effective use of the ever-popular “clue of the dying man” trope. The Adventure of the Devil’s Footprints, concerning the disappearance of a clergyman leaving behind only footprints apparently left by a man with cloven hooves, is less successful and with a plot that doesn’t quite convince but it’s still reasonably entertaining. The Adventure of the Dorrington Inheritance is a straightforward but enjoyable enough story involving the consequences of skullduggery on the diamond fields years earlier. The Adventure of the “Triple Kent” is a disappointingly obvious and entirely unconvincing triple murder story. The Adventure of the Rydberg Numbers introduces us to the brother of Solar Pons, Bancroft Pons, who is of course the equivalent of Mycroft Holmes. It’s an enjoyable and quite inventive espionage tale involving kidnapping and an eccentric young scientist who may be a genius or a madman or both. It’s an excellent little story. The Adventure of the Grice-Paterson Curse concerns a series of mysterious deaths in a house on an island, deaths that seemed likely to be murder and yet without any real evidence or any explanation as to how the murders could have been committed. Dr Parker has his own theory, much to the amusement of Pons. Derleth really has some fun with this story, with a delightfully outré solution to the puzzle (a solution that seems appropriate from an author who wrote Cthulhu Mythos stories) and a clever nod towards Sax Rohmer’s Fu Manchu stories. This one is great fun. The Adventure of the Remarkable Worm is excellent and nicely offbeat as well, with a monstrous caterpillar and a clue involving a dog although there is no dog. The Adventure of the Penny Magenta presents Pons with the challenge of solving an attempted robbery although the object of the robbery appears to be quite worthless. This story includes an homage to Poe (one of several in this collection). The Adventure of the Trained Cormorant is another good espionage tale, with a cormorant playing a key role in uncovering a German spy ring. In The Adventure of the Camberwell Beauty Solar Pons has a rather extraordinary client - none other than Dr Fu Manchu! He isn’t actually named (presumably for copyright reasons) but there’s not the slightest doubt as to his identity. His organisation is even explicitly referred to as the Si-Fan. So this story counts as both a Sherlock Holmes pastiche and a Fu Manchu pastiche. What’s interesting is that Pons is very well disposed towards Fu Manchu. Apparently he owes the Doctor a very big favour. Even in Sax Rohmer’s stories Fu Manchu it was always emphasised that Fu Manchu was a man of honour and in Derleth’s story he becomes rather sympathetic. The Adventure of the Little Hangman is a very nifty little story about the murder of a murderer. It’s one of the best stories in the collection. The Adventure of the Swedenborg Signatures relies on a plot device that never really convinces but was popular in early detective fiction and was used by Conan Doyle himself. What distinguishes these stories from the usual run of Sherlock Holmes pastiches is that Derleth was a very capable writer with a genuine flair for the writing of detective stories and a considerable talent for plotting. Even more importantly he had the ability to create plots that really do have an authentic Sherlockian flavour. The references to the works of other writers are what you’d expect from a member of Lovecraft’s literary circle, all of whom constantly referenced each other’s works. Some might find this habit annoying but given that the whole point of writing Sherlock Holmes pastiches is to have some fun I find that it adds to the enjoyment. I’m generally not a fan of pastiches but Derleth’s Solar Pons stories are well-crafted and very entertaining. Derleth doesn’t make the mistake of trying to be too clever and he wisely avoids giving the stories a tongue-in-cheek flavour. They capture enough of a Sherlockian feel to appeal to fans of the real thing. All in all they’re a good deal of fun. Recommended. John Wyndham (1903-1969) had been writing professionally since 1925 and had a couple of science fiction novels published in the 1930s (including Stowaway to Mars) but it was not until The Day of the Triffids was published in 1951 that he achieved real success. He followed The Day of the Triffids with another post-apocalyptic novel, The Kraken Wakes, in 1953. 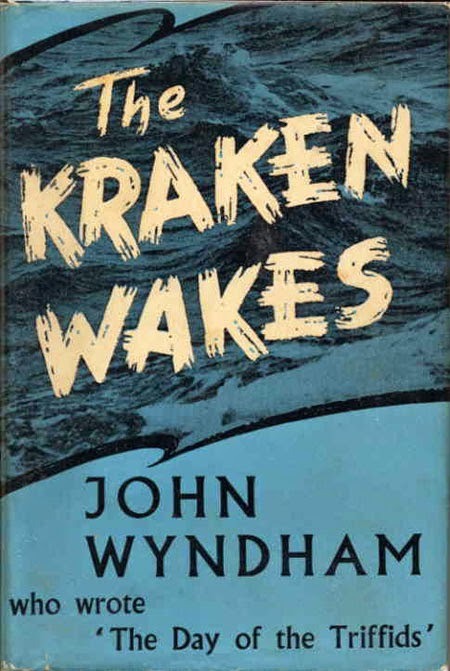 In fact all four of Wyndham’s best known novels (The Day of the Triffids, The Kraken Wakes, The Chrysalids and The Midwich Cuckoos) are either post-apocalyptic or at least deal with deadly threats to the survival of civilisation. All four approach these themes in slightly different ways. In The Kraken Wakes the menace comes from beneath the sea. Or at least it might come from beneath the sea. And then again, it might come from the stars. This novel relies for its terror on the sheer alienness of the threat - an unseen enemy whose motivations remain horrifyingly inexplicable. Wyndham understands that it is best not to try to explain the nature of the threat. If the danger is comprehensible it can be faced but in this case the danger remains stubbornly beyond the powers of anyone to understand. It starts in a very low-key way. Radio documentary broadcasters Michael and Phyllis Watson are on their honeymoon, on board the ocean liner Guinevere. A strange red light appears in the sky, followed by several more. It’s decidedly odd and rather mysterious but intriguing rather than frightening. They learn that these red lights have been seen a number of times in various places, but always at sea. It at least provides them with material for a radio spot. Then ships start to disappear. They are steaming in calm seas and there are no explosions. They simply sink, and do so within a matter of a couple of minutes. It gradually becomes apparent that the sinkings only occur in very very deep water. There is no obvious connection between the strange red lights in the sky and these unexplained maritime disasters although it does vaguely occur to Michael Watson that two sets of odd unexplained incidents, one following not long after the other, might be too much of a coincidence. There is worse to come. Much worse. It takes a long while for the public (and even longer for the government) to accept that humanity is at war. At war with mysterious forces from the depths of the deepest ocean, implacable and inscrutable. And it increasingly appears to be a war that humanity is likely to lose, with a very real danger of civilisational collapse. Wyndham is usually regarded as being a writer very concerned with the likelihood of the disappearance of a traditional English way of life that he loved very much. Certainly his heroes tend to be rather ordinary Englishmen and the action is usually set in a rather idyllic part of the countryside (in The Kraken Wakes the hero and his wife spend most of their time living in a cottage in Cornwall). There are however a couple of things that stand out very clearly in this novel that are often overlooked in discussions of Wyndham’s writing. It’s extraordinary the extent to which Wyndham anticipated the survivalist movement. In both The Day of the Triffids and The Kraken Wakes those who survive the initial disasters form themselves into tight-knit self-sufficient communities and they must defend those communities from those less provident individuals who threaten to swamp them. And they defend those communities with guns. In the post-apocalyptic worlds of John Wyndham anyone not prepared to arm themselves with guns has no chance of long-term survival. In The Kraken Wakes Phyllis Watson even makes an impassioned speech on the rights of the people to have guns with which to defend themselves, and the wickedness of the government in trying to restrict gun ownership. It’s a point of view one doesn’t quite expect from an English author writing in 1953. The novel is also absolutely scathing in its condemnation of the incompetence, short-sightedness, stupidity and outright malevolence of British government. It’s interesting to compare this novel to an earlier British post-apocalyptic science fiction novel, J. J. Connington’s 1923 best-seller Nordenholt’s Million. Connington sees the government as having the role of preserving civilisation in the face of disaster. Wyndham on the other hand portrays government as not merely useless in such a crisis, but as a positive hindrance. So it is quite possible to interpret The Kraken Wakes as a pro-gun libertarian novel. Perhaps it’s the fact that Wyndham’s style is so English and so cosy that has led people to overlook the novel’s more startling features. In this novel Wyndham also displays an extraordinary cynicism towards democracy in general, another feature of his fiction that is generally overlooked. The Kraken Wakes is a story in which the apocalypse creeps up on civilisation very slowly. At first, and for several years, there seems to be no real danger at all. Then the danger becomes more real, but still strictly limited, nothing to panic about. It goes from there to being a considerable menace but it still seems very unlikely that civilisation itself could be threatened in any way. Years pass before the threat becomes existential. This is an unusual approach for a post-apocalyptic novel but it’s highly effective. Wyndham also, thankfully, avoids the dreary cliché of having humanity responsible for its own demise. The Kraken Wakes has been somewhat overshadowed by The Day of the Triffids and The Midwich Cuckoos and oddly enough (given Wyndham’s immense popularity as a science fiction writer) has never been adapted for either film or television. Its low-key slow-burn approach makes it an interestingly different kind of post-apocalyptic novel but it’s one that is well worth seeking out. Highly recommended. 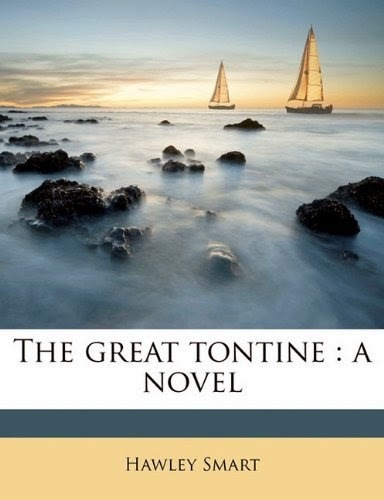 Hawley Smart’s The Great Tontine, first published in 1880, is an early crime/mystery novel. 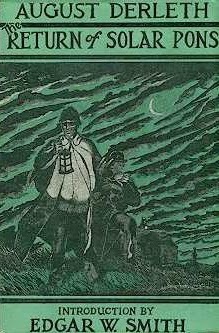 It’s one of four short novels or novellas included in the marvellous Victorian Villainies anthology, edited by Graham Greene and his brother Hugh Greene. I think it qualifies as detective fiction - at least there are several amateur detectives involved. Henry Hawley Smart (1833–1893) was a British army officer who became a reasonably prolific and successful writer, specialising in stories with a racing background. It was his lack of success as a gambler that led him to take up writing. While The Great Tontine is a mystery it certainly involves gambling, albeit gambling of a rather unusual nature. The Great Tontine is about a strange lottery, in which each ticket holder nominates the life of someone over the age of 60. The money raised is invested, in this case in an opera house, and dividends are paid. As soon as your nominated life dies, you stop getting any dividends. As more and more of these lives die, the dividends paid to the remaining stake holders keep increasing. When only one is left alive, that ticket holder collects the entire stake. In this case that amounts to 160,000 pounds. That’s in 1880 money – in modern money it would have to be tens of millions, if not hundreds of millions. So, obviously, there’s a huge temptation to cheat. When the story proper begins there are just three viable tickets remaining, belonging to an impoverished nobleman, a poor widow, and a grasping lawyer. Hawley Smart mixes some humour and some romance in with the suspense, and the result is highly entertaining. His writing style is witty and amusing. The basic idea has been copied several times, including an excellent version of the idea in an episode of The Wild, Wild West back in the late 1960s. The Great Tontine is an excellent piece of Victorian crime fiction. Charles B. Stilson’s lost world tale Polaris - of the Snows was originally published in three installments in All-Story Weekly in December 1915 and January 1916. It was followed by two more short novels, also serialised in the same pulp magazine, featuring the same hero. American pulp writer Charles B. Stilson (1880-1932) is usually regarded as an imitator of Edgar Rice Burroughs and on the basis of Polaris - of the Snows that seems a fairly accurate assessment. Tarzan of the Apes had appeared in All-Story Weekly in 1912. It has to be said however that Stilson was a competent imitator and this is an entertaining short novel. 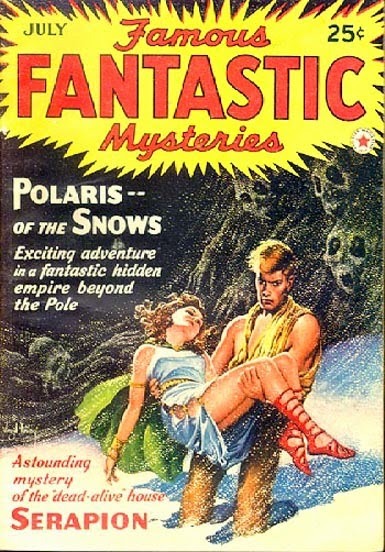 Polaris - of the Snows does in fact have many similarities to the Burroughs Tarzan stories. Polaris is a young giant of a man who has been brought up by his father in a cabin in Antarctica. The cabin was built from the wreckage that brought his father and his mother (now deceased) to the frozen continent many years earlier. They were presumably engaged on a voyage of exploration although we will not learn the whole story until the end of the book. Polaris’s father has now died and in accordance with the old man’s dying wishes Polaris sets out for the north to find the wider world he has never seen. Polaris knows little about his own origins except that he is an American gentleman. Like Tarzan (at least the Tarzan of the books rather than the Tarzan of most of the movies) Polaris possesses a wide if somewhat spotty education. He is fluent in classical Greek and Latin. He knows much of history and of the outside world although having had no experience of that world his ideas of it are a trifle eccentric. Polaris, armed with a spear, a rifle and two revolvers (athough with a very limited ammunition supply) is accompanied by his faithful dog team. It seems likely to be a lonely journey but that is about to change. Suddenly he encounters two men, one of whom is clearly trying to kill the other. Polaris has high moral principles and he knows that murder is unacceptable so he unhesitatingly slays the would-be murderer. He then discovers that there was a third member of this party, a beautiful young American woman named Rose. These three were members of a polar expedition and their ship is awaiting their return. Polaris, being naturally chivalrous, offers to conduct Rose back to her ship. The trouble is that Rose is hopelessly lost so this may be a rather difficult undertaking. It is also a very dangerous undertaking. 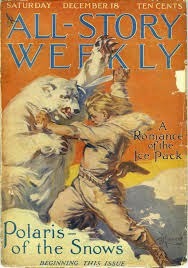 Apart from being marooned on drifting ice floes they face the constant menace of attack from polar bears (yes I know there are no polar bears in Antarctica but this is an adventure story so the hero has to face dangerous wild animals and polar bears are more convincing adversaries than angry penguins). For various reasons our adventurers find themselves driven southward again and they notice something rather odd. The further southward they go the warmer it gets. Even odder they find themselves showered with ashes. The sight of a mountain belching smoke provides the explanation. What they have found turns out not to be one volcano, but a whole range of volcanoes enclosing a hidden valley. The valley itself is green and temperate. It is also inhabited. Inhabited by people who speak classical Greek. This lost world turns out to be not quite the paradise it seemed at first. The people of Sardanes suffer from the usual human weaknesses - jealousy, suspicion, fear, ambition, avarice. Polaris and Rose soon find themselves in a rather tricky situation, and their adventures have only just begun. The secret to writing good pulp fiction is to keep the action moving along as briskly as possible and Stilson certainly knows how to do that. His world-building is less impressive than that of Burroughs (who was a master of that particular art) but it’s competent enough. Polaris is pretty much an Antarctic version of Tarzan but without the complexity and without the tragic sense of being a man caught between two worlds. The other characters are pretty stock-standard adventure story types. Rose is the equivalent of Tarzan’s Jane but again rather less complex and interesting. It’s worth pointing out that Burroughs was a very fine writer indeed, one of the grand masters of pulp fiction. Stilson is not in the same league but he’s still a competent story-teller and he handles his action scenes quite adroitly. Polaris - of the Snows is an enjoyable and well-crafted tale of adventure. Recommended. All three Polaris novels were published in paperback by Altus Press in 2008. The Long Divorce, published in 1952, was the next-to-last of Edmund Crispin’s detective novels featuring Oxford don Gervase Fen. Composer Bruce Montgomery (1921-1978) wrote nine Gervase Fen mysteries, mostly between the mid-1940s and the early 1950s with the ninth book appearing after a very long gap (the gap being partly a result of Montgomery’s battles with alcoholism). Many writers of detective stories have tried to combine detection with comedy but very few succeeded as well as Crispin. His books are often laugh-out-loud funny and always delightful. It has to be said however that The Long Divorce is a lesser effort (possible the author’s alcohol problems were already catching up with him). The peaceful existence of the inhabitants of the sleepy village of Cotten Abbas has been rudely disrupted by an outbreak of poison pen letters. Some of the letters are merely of the usual sort, abusive and obscene, but the really worrying ones are disturbingly accurate. The arrival of the mysterious Mr Datchery has also caused considerable speculation. Much of the speculation is to the effect that he is obviously not what he seems to be but no-one is quite sure who or what he really is. Inspector Casby is a competent and industrious police officer but the letters have him baffled. Of more concern to him is that local doctor Helen Downing appears to be involved somehow although he is sure that she is not responsible for the letters. His concern arises from the fact that he has found himself falling very much in love with Dr Downing. Poison pen letters are one thing but more serious events are about to disturb the peace of Cotten Abbas - a suicide, a murder and a disappearance. Crispin was known for his fairly outlandish plots. In this particular case I felt there were a few problems with the plotting, with some very dubious motivations depending on rather far-fetched conspiracies and unlikely sequences of events. There are also a couple of elements that struck me as being a trifle obvious and heavy-handed. Of course it’s the nature of detective fiction that it’s difficult to offer such criticisms because any attempt to back them up with evidence is almost certainly going to reveal spoilers and that’s something I have no intention of doing. I also felt that while there were some very amusing moments this one lacked the sparkle that made Buried for Pleasure and Frequent Hearses so immensely enjoyable. The plot also lacked the brilliance that Crispin displayed in The Moving Toyshop. The nature of the plot (again I’m being careful to avoid spoilers) also means that Gervase Fen is unable to be quite so outrageously witty and Gervase Fen-like. 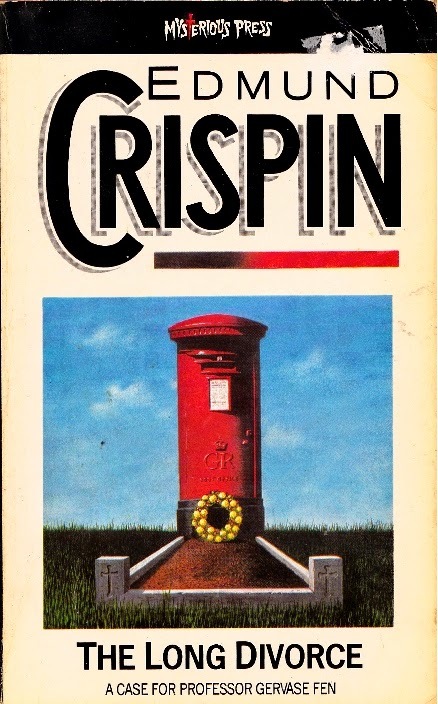 Even a lesser Crispin is worth reading, and is certainly vastly superior to what passes for crime fiction today. Recommended, but if you’re new to Crispin read The Moving Toyshop, Buried for Pleasure and Frequent Hearses first.